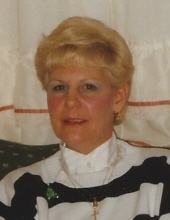 Jean Fendeis, 79, passed away January 25, 2019. A long-time resident of Garwood, she lived in Clark for the last 20 years. Friends are invited to visit Monday January 28th from 4-8pm at Dooley Funeral Home, 218 North Ave. West in Cranford. A Mass of Christian Burial will be Tuesday January 29th 9:45am at St Agnes Church, Clark. Jean had been employed at AT&T for 30 years and was a member of the Telephone Pioneers of America. She was predeceased by her husband Ernest, and her parents Frank and Anne Criscola. Surviving are her two daughters Carolan Pickering(Kenneth) of Newton, and Theresa Pierce(Michael) of Rahway, two grandchildren Melissa and Christopher, and one great-grandchild Benjamin. Jean is also survived by her three sisters Joan McCarthy, Judith Deevey, and Janet Davey. In lieu of flowers donations to be made to St. Jude Children’s Hospital. To send flowers or a remembrance gift to the family of Jean Fendeis, please visit our Tribute Store. "Email Address" would like to share the life celebration of Jean Fendeis. Click on the "link" to go to share a favorite memory or leave a condolence message for the family.